How do I get to the Denver Athletic Club and where can I park? What is the program for the evening? What type of food will be served? What if I have a dietary restriction? Are kids able to attend? What types of items will be in the silent auction? Who are some of your sponsors? The event will be held Saturday, April 20, 2019 from 5:30 pm - 10:30 pm in the Grand Ballroom at the Denver Athletic Club, 1325 Glenarm Place, Denver, CO 80204. Don't forget to complete the menu form it is available as a downloadable PDF or an online form with any ticket or table sponsor purchase. The Denver Athletic Club is located in central downtown Denver between 13th, 14th, Glenarm and Welton Streets at 1325 Glenarm Place. Limited parking is available at the Denver Athletic Club's parking garage, located on the corner of 14th and Welton. The entrance is on the 14th Street side and is $7 per vehicle for the event (overnight parking is $25). Find more information on nearby paid parking lots. There will be an open bar from 5:30 pm to 7:30 . A cash bar will be open afterwards - one of the bars will be able to accept credit cards. This event is being catered by Denver Athletic Club. Dietary restrictions can be accommodated upon request, please advise of any restrictions and extreme allergies when purchasing tickets. If you have any dietary restrictions we will do our best to meet your needs. After purchasing tickets, you will be directed to a page to specify your meal choice. There will also be an area for you to specify any specific requirements. The attire for the evening is semi-formal. Here is a small list of some of our auction items. Love for Life wouldn't be possible without the support of our sponsors. Please support them in return. We are in need of volunteers for many different aspects of the event, allowing you to volunteer the time that works best for you. We need people to help secure donations, advertise, set-up event, breakdown event, transport donations, and other event related activities. Please contact us for more information. For in-kind donations (services or products), please contact Morgan. For monetary donations, you may pay online via the PayPal or Colorado Gives buttons below. To donate via check, please mail to: Life is Better Rescue, PO Box 19159, Denver, CO 80219. Financial or in-kind support helps directly with animal care. 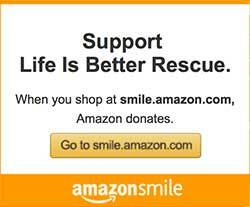 Life is Better Rescue is an IRS 501(c)(3) recognized charity, and all donations are tax deductible.